Here are four simple steps to set up Sutori in Schoology. In a few minutes, your teachers will be able to access Sutori within the app. Locate Sutori on the App Center. We can be found under &apos;LTI apps&apos;. Please note that only administrators may find Sutori on the Schoology App Center. Press the blue button: &apos;Install LTI App&apos;. You can then choose to install the App for the organization (recommended for all your teachers to access) or just for yourself if you would like to do some testing beforehand. 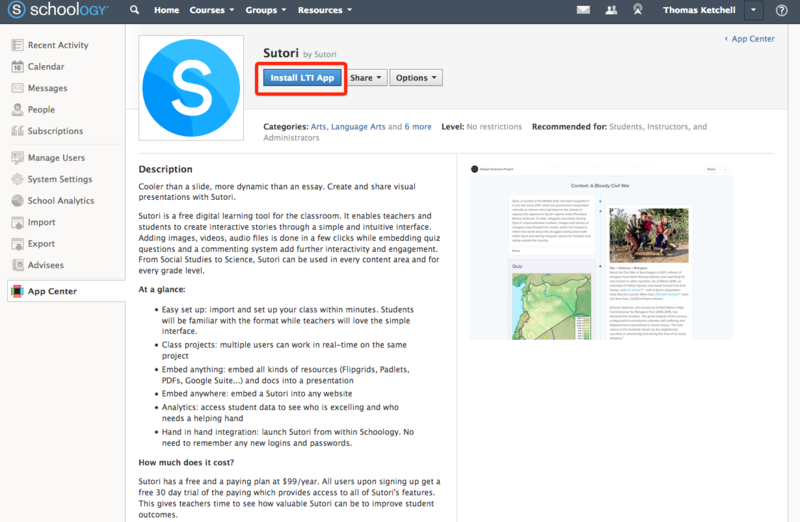 Locate Sutori in your &apos;Organization Apps&apos; and configure it so your teachers can use it. If you have not done it already, email us at sales@sutori.com to receive from us the &apos;Shared Secret&apos; and &apos;Consumer Key&apos;. Enter the keys provided and click &apos;Save Settings&apos;. Teachers will now be able to run Sutori directly from their organization&apos;s apps and use it with their students in different courses. Congrats! You have successfully added Sutori. If you&apos;re a teacher looking at how to setup Sutori for your course, please follow this link to get setup. You may find Sutori on the Schoology App Center at the following link.